If you loved our original Into the Woods collection from Kanvas, you'll be thrilled to know that it was so popular, we created a sequel. Into the Woods II features realistic wolves, trees, and leaves, and cool transparent silhouette prints of moose and bears. 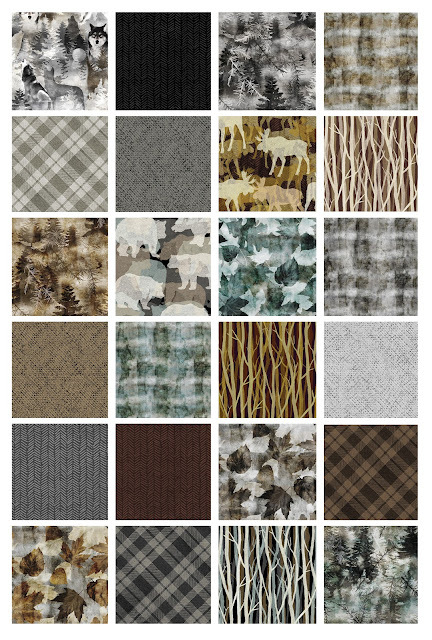 Add in a few coordinates--tree branches, bark, plaids and herringbones--and you've got everything you need for your next outdoor-inspired quilt. Click here to see the entire Into the Woods II collection. I absolutely love Into the Woods II. My mind is already coming up with ideas for unique quilt designs for this fantastic fabric line. Really cool fabrics! Happy New Year! These are ideal to make quilts for guys in my life! Very woodsy, quiet and masculine.